For the majority of commercial companies as well as educational establishments creating of additional computerized workplaces is the important part of working process. If you are a small business owner, you may be interested in using multiple computer monitors from a single system as an inexpensive way to extend computer resources with minimum investments. IBIK company is ready to offer you professional ASTER software that provides faster and less costly equipping of employee stations through the usage of a single computer with multiple monitors. ASTER is a rather affordable and highly-efficient solution designed to enhance computer resources and run multiple monitors on one computer. When you know how to connect multiple monitors to a single computer system, you can count on inexpensive computerization of your office through reducing the number of computer boxes being purchased and maintained. Moreover, using multiple computer monitors means a lesser dose of harmful radiation and electric power usage compared to stand alone computer systems. You don't need to buy a set of computers to equip employee workplaces anymore as our powerful ASTER software allows you to run a computer with multiple monitors on the basis of one system unit, additional monitors, keyboards and mouse devices. There is also no need to install a local network as, when you connect multiple monitors to one computer, all common resources and devices are automatically accessible from every account. 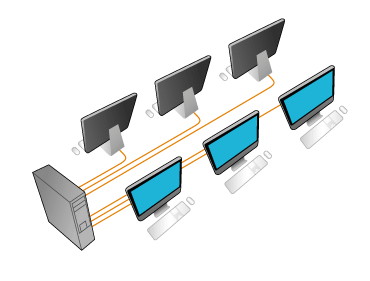 In addition, by using multiple computer monitors on a single computer system, all connected users can work simultaneously with the same or different projects without interrupting each other's operation. Whether you need to equip computer classes, libraries, accounting departments, offices or Internet cafes, think about running multiple monitors on one computer. Download a free trial version of ASTER software online on our website and try its powerful features before making a purchase.